Every two years, women of the Church of God gather together in a select city to reconnect, worship together, and grow together. 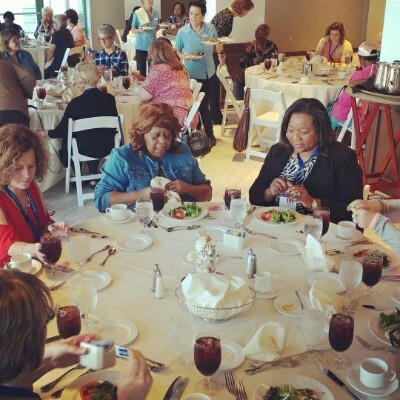 Hosted by Christian Women Connection, the event has welcomed women and men from across the country and beyond to destinations like Dallas, Seattle, Nashville, and Daytona Beach. This year’s Church of God Women’s Convention will be held in Myrtle Beach, South Carolina, October 10–13, and will feature some of the brightest and best women preachers, worship ministers, and conference leaders the Church of God has ever known. Combined with new service opportunities and new tracks for women in ministry and clergy wives, “Women Shaping the Future” is certain to be one of the most anticipated events of the year. Jeannette Flynn, Mailesi Ndao, Joy Sherman, and Tatum Osbourne are among the featured speakers for the Myrtle Beach experience, as Leslie Parker Barnes and Carma Wood are slated to serve as worship leaders. A new track of conferences designed especially for women in ministry will address topics like “How to Facilitate Change,” “Ministry within Healthy Boundaries,” and “Balancing Ministry and Personal Life.” One of those events will feature lunch, “The Power of Influence.” The clergy wives’ track is also designed to address the specific needs of another vitally important demographic. Additionally, a conference for young women, a prayer breakfast, and a variety of other conferences, banquets, and service opportunities to support missions are sure to refresh and inspire attendees of the convention. Prayer for Arnetta McNeese Bailey at Church of God Women’s Convention 2017. Did you know husbands are welcome to attend, too? 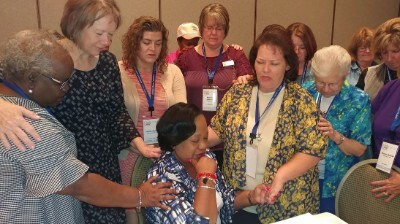 Though the women’s conferences are reserved for women only, men can register for a special discounted rate and are encouraged to attend the worship services, banquet, prayer breakfast, and a conference designed especially for men, led by former AU School of Theology & Christian Ministry dean, James Lewis. Great food is always a highlight of the Church of God Women’s Convention! The theme, “Women Shaping the Future,” comes from Acts 16:15, where Lydia and her household were saved and baptized. What came next was an invitation of hospitality and the powerful phrase, “And she persuaded us.” CWC explains it this way: “Just like Lydia, many of the women in the Church of God, whether they are clergy, CWC leaders, lay leaders, business owners, parachurch ministry leaders, or professionals in other vocations, they are worshipers. They are worshipers who are persuaders.” And they are shaping the future! If you register during the month of April, you can enter a drawing to have an opportunity to win a “Gift Basket from Around the World.” Results will be announced during the first week of May. For registration and more information, visit http://www.christianwomenconnection.org/convention-2019.html. This entry was posted in All Church of God and tagged Arnetta Bailey, Arnetta McNeese Bailey, Christian Women Connection, Church of God Women's Convention, clergy wives, clergy woman, clergy women, clergywoman, clergywomen, conferences, CWC, CWCfuture, Melanie Thigpen, Myrtle Beach, pastors' wives, SC, South Carolina, women in ministry, Women of the Church of God, Women Shaping the Future. Bookmark the permalink.